We partner with the very best manufacturers in the industry, so you can be sure of getting the very best solutions available on the market. We have partnered with Jabra to offer you the very best quality and deals in Headsets, recognising that operational costs are a big issue for all businesses and where we can do our bit to help reduce them, we'll do our very best. Jabra are a global producer of headset and speakerphone solutions for the office, contact centre and mobile communications markets. IISAS have many years experience designing, installing and supporting telecoms solutions for contact centres and multi-site offices. 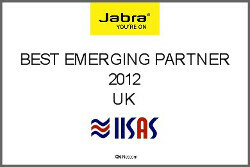 Our partnership with Jabra means that we can provide you with the best sound quality for your employees and customers. A real cost effective headset. In our experience, the quality of Jabra headsets is so high, that the lifetime cost will be much less than comparable headsets. This is of particular importance in environments such as contact centres and large office environments.